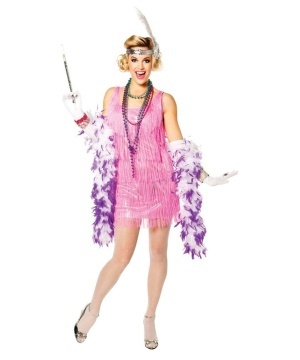 Flapper Costumes bring back the liveliness of the 1920s. 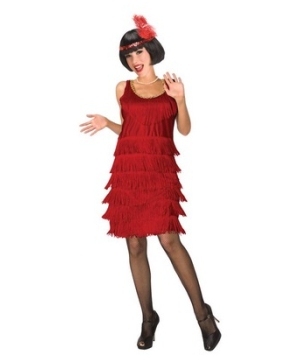 Your Halloween night or theme party will be that much more special when you get one of these dazzling Flapper Costumes. In the past few years, all the craze with Flapper Costumes has been directly associated with the release The Great Gatsby movie, which is the remake of 1974’s, 1949’s and 1926’s The Great Gatsby films based on F. Scott Fitzgerald’s 1925 novel. In preparation for the 100th year mark of the “roaring 20’s” women (and girls) all over the world have started to wear what their grandmothers and great-grandmothers used to wear in the 3rd decade of the twentieth century. 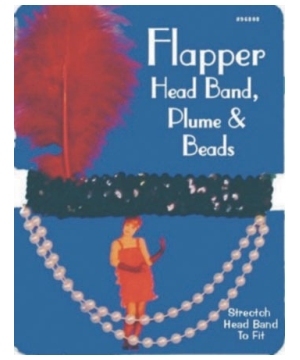 Accessories to accentuate your Flapper Costumes include straight-bang/bob-style, finger-wave or lovely curl wigs, headpieces such as stretch, sequin headbands with feathers or flowers, long, pearl necklaces, boas, cigarette holders, rhinestone jewelry, long satin gloves, thigh highs, fishnet stockings, garters, matching handbags and shoes. The slang word flapper, described a young woman referring to a young bird flapping its wings while learning to fly (“social butterfly”). On one hand, the 1920’s may have been time when the Prohibition Era was instated, but on the other hand, new fashion possibilities were not prohibited. There was a new and distinct sense of freedom where strict Victorian roles started to overturn. “Flappers” also began working outside the home and challenging women's traditional societal roles at a time when women won the right to vote. The end of the exuberant flapper lifestyle and look disappeared in America during the Great Depression. The 20’s rich attitudes became unacceptable during the financial hardships of the 30’s. 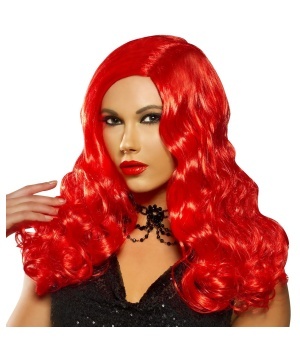 Now for the first time in years, Flapper Costumes are selling like hot cakes. Let this contagious and fun-style decorate your body at your next event, birthday or Halloween party. You’ll look as if you’ve traveled back in time. Revive the pure excitement of the roaring 20's when instead of cell phones, men and women used their eyes to communicate.